A classic white kitchen will always be my first choice. But since they have (happily) been trending in the last 9 years since the fresh (grey) trend happened, and as the average trend cycle lasts about 10 years, well, there are naturally those who are looking for something new or different. And guess what? There’s a whole new look for wood kitchens, and it’s much fresher. 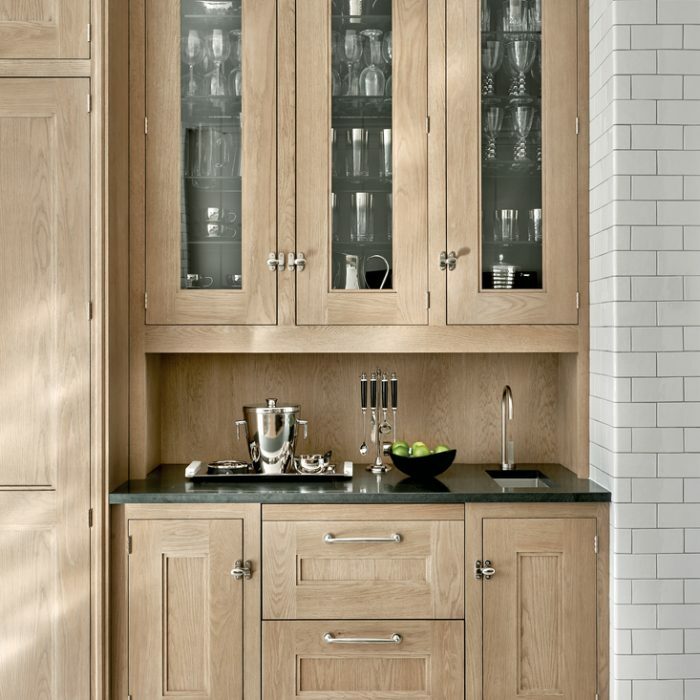 Lots of recently designed wood kitchens I’ve seen, have managed to sidestep the main issue with traditional ones: dated stains and finishes that are intended to create a “rich” look like cherry, golden oak or espresso but tend to look heavy, dark and overly formal. And I’ve talked a lot about how a particular stain will date a kitchen quickly. For example, although there are outliers, generally, golden oak kitchens peaked in the 80s, cherry and orange maple 10 years after that, and then espresso in the early 2000s. They look of their time, and this is why I caution against installing a wood stained kitchen. Right now, the wood stain that will be associated with this trend moment is anything grayed, weathered or “reclaimed”. It’s much more difficult to guess the date of white cabinets, unless a trendy backsplash gives them away. New ashy (cooler), unstained wood tones are cropping up in kitchens everywhere right now, and I think they will have a bit more staying power and this is why. First, they are lighter, airier and more natural looking which has broad and enduring appeal. Second, they are much less likely to be combined with busy earthy granite and tile which is what made the dated warm wood kitchens so heavy and hard to live with. In the nicest current wood stained kitchens, there is a beautiful balance of natural wood tones and crisp white. Here’s the pretty butler’s pantry from the same kitchen below. And I’ve always said that the way to make a wood stained kitchen look fresher and more timeless is to install a white countertop and backsplash. Because of technological improvements, wood finishes don’t yellow the way the old lacquers and alkyds did. These new natural wood tones are not just a passing trend, but a new classic. They are prettier because you can clear coat them without creating a warmer yellow cast so that the wood looks as fresh as when it was cut. It’s the same with the current natural unstained oak floors. They are just as classic and neutral as a pale maple or medium brown walnut. It’s when they are grayed or overly rustic that they are more faddish and eventually dated. People are looking for fresh, light and casual, and natural light wood tones fit the bill perfectly while still providing some warm earthiness to a light and bright space. The new wood finishes are grounding but not stuffy or heavy. I don’t think the gold, orange and red wood stains of decades past will have time in the trend spotlight again anytime soon, but unstained wood has enduring appeal, it feels fresh and modern. A little bit of wood or wicker is always pretty in a white kitchen and it’s also true that what makes a light oak or maple kitchen just right is lots of crisp white. 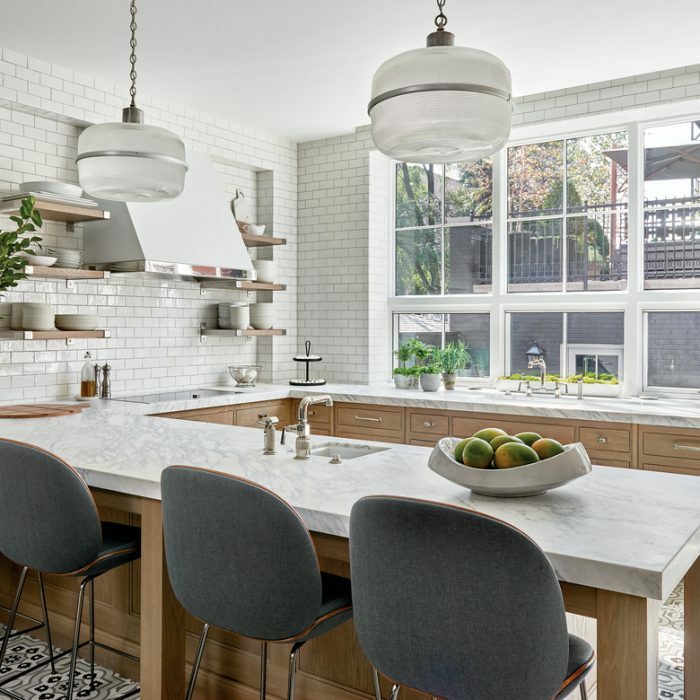 While grey or soapstone countertops can look pretty in a light wood kitchen, there should really be a white backsplash and nice light walls to balance it out. Here’s another pretty rift oak kitchen with soapstone counters and a brick floor (below). So if a wood kitchen is your thing, natural unstained oak or maple is what I recommend, along with lots of fresh white and maybe some soapstone which I’ve been seeing a lot of lately; another trending classic. A word of caution however, look for a truly natural looking finish and beware of anything with a gray or taupe cast, or anything that looks overly rustic, these are part of the gray trend and will soon look dated. I also think that cerused wood could come off as dated in time just as the pickled oak of the 80s did. In other words, the more natural the better, keep it simple. If you like a gray wash, cerused or rustic feel to your wood, indulge in it with a furniture piece, not your custom kitchen cabinets. After all, the goal should be to only design your kitchen once and love it forever. So over to you my lovelies, what do you think of the new look of wood kitchens? PS. OMG I keep forgetting to tell you that I won second place in the Best Design Influencers award with Modenus! And that’s because of your votes, thank you so much!! I love my readers, ya’ll are the best, truly! I am so grateful for this amazing community! Everything comes back again, but different. The oak kitchens of yesterday are certainly not the oak kitchens of today. Nor will oak kitchens today be the same oak kitchens tomorrow. Which is why if I had to do it all over again, it would be white white white. A backsplash is fairly easy to change out. Cabinets are not. I’ve been seeing these lighter wood kitchens for a while now also. I think what makes them “timeless” is that the wood tones are a light true brown . . . the same thing that makes a light brown wood floor timeless. These kitchens will age well. It’s the wood tones that veer hard in any other direction that usually look trendy and bossy. Maria, what do you think of the new white wood flooring? I rather like it and don’t find it bossy. I’m getting ready to spec my clients (first in 12 years), light wood kitchen. I see all of your photos seem to have tile floors. How do we match a wood floor with a wood kitchen? I know to go with the same undertone, but even if I pull a colour from the floor, for the wood cabinets, and have one wood lighter, and one darker, it still looks like wood on wood. Most clients have wood flooring in their kitchens as most are open concept. Must say I’m struggling with this one! It is a beautiful kitchen. Love this type of wood, driftwood look, for now. But, it is not timeless. You might be able to have the cabinets painted white or a color that you like if stripping, sanding and retaining is not an option. If you do replace the cabinets, consider selling or donating them to an organization like Habitat for Humanity. They often have resell stores. Reduce, reuse, recycle! Good luck with your decision and project. Love it. Feels timeless to me! In my endless perusal of mid-range real estate listings in rural New York, I see mostly dark wood recently updated (eek! where are these people getting their ideas?) kitchens or earlier kitchens that scream their era. But rarely I see one with natural wood cabs, and even though I love white and chose it for my kitchen, the natural wood makes me think, I could live with that. So it seems to me that you’re on target in saying that the light, natural wood will have staying power. The kitchens you show are lovely, so different from that older heavy look or from trends like pickled wood. My favorite kitchen is from an early era, with a big fireplace you can cook in, a beehive oven, open shelving and places to hang pots, a French range, and real furniture. Maybe in another life . . . The first or top photo is appealing, perhaps because the wood is on the bottom part of the kitchen and the white fills the upper parts of the kitchen, and it feels fresh. I still prefer white kitchens. If I ever consider using wood in a kitchen, this is a post I will read again for the helpful ideas. Congratulations on the BDI award with Modenus! I chose natural red birch cabinets when we redid the kitchen in my previous house 20 years ago. I scrubbed them clean when we sold the house and they looked almost new — that is the nice thing about natural wood. In my new house I chose the same natural red birch for the lower cabinets and white for the upper. White quartz countertops and a light gray/blue subway tile backsplash. Natural pine floors. (I am on the coast.). I am so happy with the look! I find that I have to be careful with the white finish on the upper cabinets, but I know from previous experience that the natural wood cabinets will hold up over time. I personally like the warmth that natural wood brings to the kitchen, especially when combined with other white finishes. I’ll stick with classic white kitchen thanks. Congratulations on your award! What an accomplishment! Having said that, I think I’m going to peace out on your blog for a bit and here is why: this post rubbed me the wrong way, and I know it wasn’t intentional. 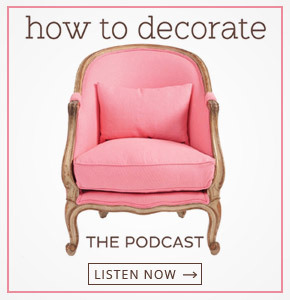 I feel like your blog is best when you are instructing readers about how to match undertones, when to match, when not, and advice about how to update a room or pick stone that works with your paint. 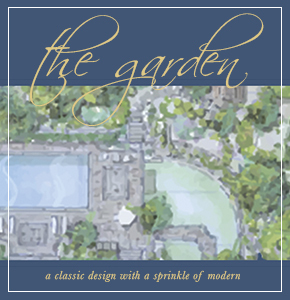 However, the blog has gone towards this: trendy or classic? And are you smart enough to get ahead of the curve. That is a false dichotomy and it is a bit harmful. I finished this post feeling deflated b/c we are building a new house and “new builds” aren’t really updated in our area for the latest wood trends, nor could we afford it if this wood were an option. We are lucky we could build a house in a nicer area. And in fact, I am not a “new build” person, my dream is a colonial on a charming street that I can update. However, in our area, and having young children, new builds are better neighborhoods for kids — b/c there are more kids– and we want that for our children. The white cabinets we could choose were engineered wood and they were stark raving white, plus the open space didn’t “want” white, in my opinion. Having read your blog that blue gray is going to be out and trying to make the best choice we could, I went with what appealed to me and what seemed a bit warmer (oh no…taupey) gray. We did a white counter top to brighten it up, and oh no, clean/dirty combo. I don’t even think it has cream undertone. Now, had we gone with wood, it would most likely be baseball bat looking wood. I am happy with what we chose, knowing it won’t be my taste forever and that it isn’t what I would have chosen if I could design my own kitchen and choose my own cupboards. But now I should say…I was happy…until I read your post and was informed that taupey gray is quickly on it;s way out. It is? I feel like I committed some oddly moral crime! I feel like this classic or trendy thing doesn’t help most people, because more people are in my boat than in the boat of the designer above who created these kitchens…and these are the lucky people, of course, b/c they can at least buy a new house. I also think the classic/trendy thing is misleading in another way. I agree that a white kitchen can be a safe and always-around way to go. But even there, the truly classic looking white kitchens have a certain sharp look to them — cupboards that go to the ceiling, the cabinets LOOK expensive and there is usually a bit of warmth to them. My friends were finally able to redo their kitchen but couldn’t afford to change the cabinets. She chose white paint to update the builder grade wood and she couldn’t even (reasonably) get the white paint she wanted. Her husband insisted on the practical glossy finish or whatever is recommended, and it made most sense, according to the local SW store, just to go with a white white ($), not Alabaster or the white she wanted. Again, this is the boat most people are in. They are making compromises with spouses and money, or whatever else. And since the cabinets themselves were older and smaller, the overall effect was, yes, updated and very nice, but I wouldn’t even say it is a classic kitchen! (My mom, other hand, has a pale green cabinet with a minty undertone, tile from the 30s or 40s when the house was built, that she never got rid of, and her kitchen has looked classic even before minty undertones were trendy. She has white counter tops. 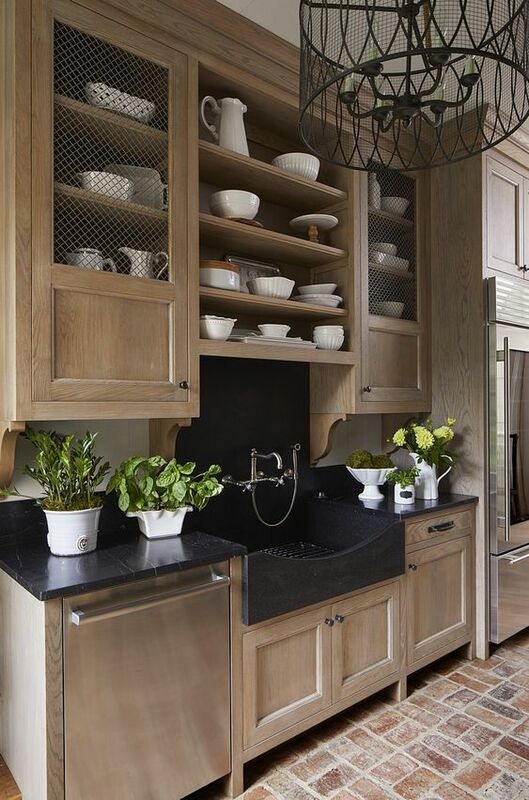 As well, since passing up a grayer gray (cooler), I notice that gray really is a classic color, even if gray cabinets won’t always be “the look.” If you look at houses in historical neighborhoods and even historical colors, it IS a classic colorl. As well, many of the colors in Farrow and Ball are classic English colors that are taupey, gray, dirty, and I always love them. I do like your advice about using white to crisp things up a bit, or how to like floors, carpeting, cupboards, etc. you are stuck with by matching undertones rather than contrasting them. (The Makerista blog has sage green cabinets that look beautiful and classic with her black and white floor and white subway tile (which I know you think are classic and always a good choice), but sage green really isn’t in now, nor was it a couple years ago when she chose it based on her love of all things English. But that’s the point…our personal styles need to shine through and we need bloggers like you to tame them with correct undertones and balanced countertop colors. I also think rooms need tension, yin and yang, something interesting. They end up this way b/c they end up with compromise due to badly measured beams and floors that settle, etc. etc. A clean room ends up with a beautiful “dirty” picture b/c the person fell in love with the picture, or her child gave her the picture, whatever. I would prefer going back to advice about cultivating a style and improving on what you can regardless of budget, etc. And frankly, almost no one is going to love one exact look forever. People fail to update after 10 years (often) b/c they can’t, not b/c they love it forever and ever! Thanks for your reply, just saw this. That is quite an insight about colors being more classic, I feel like I have read all of your blog posts, but I missed that one, which makes sense. I also do tend to focus on posts about neutrals! Sorry, think I was just having a moment. I am second guessing like every choice I made in May, and since they give you a small square to look at for many c hoices when you build a home, it’s ridiculous. (I suggested they go get the bigger squares direct from Sherwin Williams for paint–they use SW exclusively–and even the designers stared blankly at me. Luckily for me, I was set b/c I knew all the undertones of the neutral categories we could pick from and did a good job matching the undertone of the cabinets to the paint. It all turned out quite nice, in part, due to your posts. What I am bummed about is that in the showroom, the level we could choose from for carpeting upstairs was few and I thought I picked one with a silvery-undertone, but it looks taupe. The designer convinced me to do a cooler gray green in the master and they do not go, except at precisely one time of day when the sun casts a bit of silver on the carpeting (lol). I said that same color didn’t go with the master bath cabinet, but she insisted they did. Guess what? They don’t! I know that from you. Each time I even try to convince myself b/c my husband wants me to let it be, I can just see taup-y gray in the cabinet and green gray on the walls. Hubby has conceded to pain the cabinet after move in, but I am stuck with carpeting right now. (I don’t like carpeting, period, but we could only do so many upgrades. At least where I see errors, I know that I can make it look good/cohesive with paint since that is cheaper and more doable right now! I absolutely love the natural wood look. You mention oak and maple but what about other woods with a natural finish. I’m thinking of cherry that is not stained just sealed. When it’s done with flat front or shaker doors that appears classic to me too. Especially if it fits the era and architectural style of the house. Your thoughts? I love your website and get excited every time I see a email from you! PS. Your sister’s kitchen with the natural cabinets and white backsplash with a light counter is one I go back to over and over for inspiration. Maria, what would be an equivalent paint color to the BK Interiors picture posted above on the kitchen walls? It appears they might be plaster but worth a try to duplicate the warmth with paint as it goes great with those wood cabinets! Love this post and your insight – thank you! I love this look. It’s restful and so pleasing on the eye. Someday, someday, I’ll have my cabinets refinished and I’ll definitely go for a nice stained look that will show the grain of the wood. You’ve inspired me! What are your thoughts on using hickory or knotty alder (with few knots) in a medium color stain with a coat of glaze? I’ve heard that it is a good idea to use a lighter shade stain for the wooden floors which may be stained white oak. (When I built a home more than 25 years ago with oak cabinets–maybe they are what some refer to as “orange oak” they also suggested I use the same color stain on the oak floors. Seems they would not do that today, but I have not found it to be objectionable or as some suggested “too much wood”. I’m having some conflicting thoughts about what is considered classic wood stains. I toured the Biltmore mansion and the kitchens were loaded with built in cabinetry from 1900, and nobody would say they were “outdated”, they were gorgeous. But they were a darker stain. Not espresso, but not pale either. I think it all depends on context. Yes! Yes! Yes! You nailed it. And the kitchen from Home Bunch-absolutely swoon worthy. Thank you for blogging about a beautiful trending new classic! Maria, this post makes me very happy because it explains how if I paint my walls off white, add some glass to my upper doors, add a lighter counter, and bring the wood floor into my kitchen from the rest of the house, my kitchen will look lighter and updated and I won’t have to change my cupboards, which, happily are a brown wood stain which is neutral in a classic shaker style. Thank you for your insightful and current advice. I don’t always have time to read it in the school year (I am a teacher) but it is always helpful. It’s nice, not my style. It reminds me of how the gray winter light in the Pacific Northwest washes out everything–I can’t imagine this with a cool bright color scheme. It’s desaturated. I wouldn’t want to sit or cook in that kitchen. But it certainly looks lovely and I’m sure the people who like it will enjoy having it around as an option. YES! I love this! I have wood cabinets, and with how heavily I use my kitchen, I’d be scrubbing all day every day to maintain a lovely all white kitchen. Can’t do it. I’ve been telling my husband I just want to strip my cabinets down to a light natural finish as a compromise. He (wisely, haha!) keeps objecting to starting a project that crazy, but with this post as support, I’ll hold that thought for later when my current kitchen gives up the ghost and I build a new one. My one regret to this house (OK, my MAJOR regret, I have more than one, haha) has always been that the kitchen is “good enough”. Can’t wait until it wears out!!! I’m curious what topcoats keep the wood from turning orange. We had natural oak installed and it yellowed horribly after a few years. It was worse where the sun hit the cabinets. I couldn’t stand the color and stained them. I’m tired of the dark stain and they’ll be painted white. I really like the color wood shown above but does it really stay that color? One of the differences to the kitchens from a couple of decades ago, is that these cabinets are not combined with wood floors. The wood on wood look is so heavy. Also, most of these cabinets are inset or full overlay, not the partial overlay which dates wood cabinets. 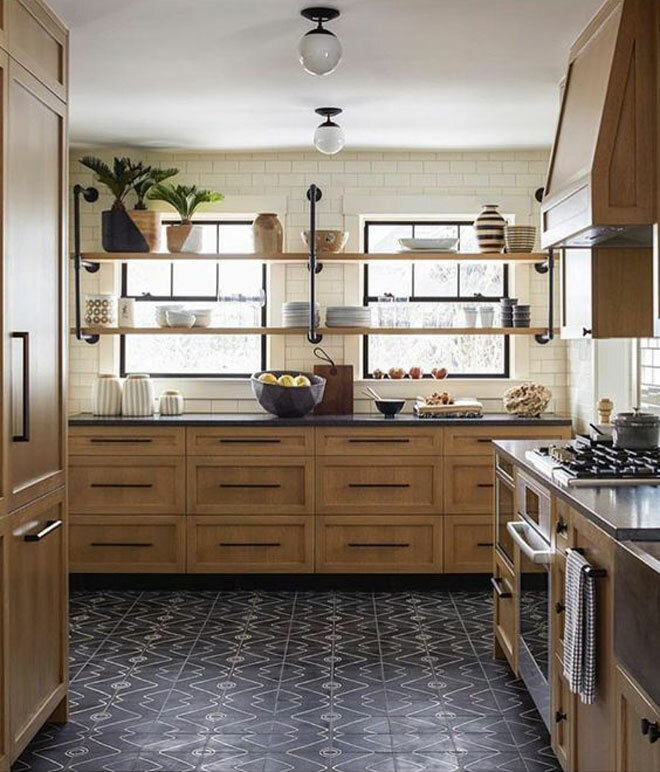 I love this look but I also love wood floors in the kitchen… which makes the choice for me to go with painted cabinets. Love reading your posts! Love wood, always timeless, so tired of white, how dull and in restive. While these kitchens are very beautiful – they are not timeless. Every kitchen trend becomes dated. I remember when we were looking at houses 20 years ago and all the rage was cherry cabinets and limestone/travertine/marble backsplashes. Everyone said – cherry is timeless/classic and natural stone never goes out of style. My friend who had a very high end white on white kitchen was told to rip everything out and replace it with cherry and natural stone. I have owned many houses and every house was timeless then dated in a matter of years. The only time a kitchen is classic is when it is cohesive with the style of the house and honors the architecture. What a joke designers are these days to try to convince people the newest thing they are peddling is timeless.